This is the ultimate comfort food. Easy to eat (like porridge) but with the most amazing flavour (unlike porridge). 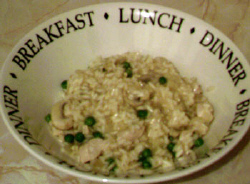 Obviously risotto is an Italian dish, but the chicken and mushroom - and probably the peas too - make it seem strangely English. You can use leftover cooked chicken, but for best results put one large chicken breast* (skin side up) in a flameproof casserole dish and cook in the oven for 20-25 minutes at 190° (gas mark 5). Leave to cool then remove and discard the skin before chopping the chicken into whatever size pieces you fancy. Don't wash up the dish! Finely chop the onions, crush the garlic and slice the mushrooms. Leave the mushroom slices with bits of stalk on as they are but finely chop the rest (i.e. the end bits). Put the stock in a pan over a low heat so it stays simmering gently. The dish that you cooked the chicken in will have some chicken fat and stuff in it - top it up with enough olive oil to cover the bottom and put on a fairly low heat. Fry the onion for a few minutes until soft. Add the garlic and finely chopped mushrooms and cook for another few minutes. Add the rice and stir thoroughly before turning the heat up to just above medium. Chuck in the wine and stir continually until nearly absorbed. Add the sliced mushrooms. The next stage will take about 20 minutes. You need to add about 100ml of the stock then stir continuously until it's almost absorbed. Add more stock and continue the process. About 5 minutes before the end add the frozen peas, and the chicken right near the end just to heat through. The finished risotto should be sticky and not too dry. * UPDATE: Actually I'm not sure about this. I recently made it with left over roast chicken and used the carcass to make the stock, which gave the whole thing a sort of "completeness".